My favourite Christmas gift! I have to really sit down and play with this one since it's a bit more complicated than the Pentax. Once I get it figured out though, I think it will really rock! Although the Pentax will still feature quite a bit due to it's Macro capabilities and pocket size. The husband's favourite gift. One sock. 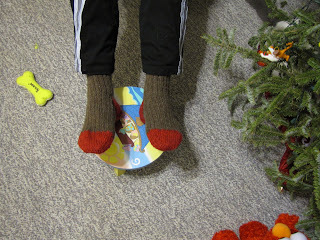 I was almost finished the other one until I realized that I had not done any of the decreases after turning the heel. Perfect, if he had a club foot. Fortunately these are a quick knit. 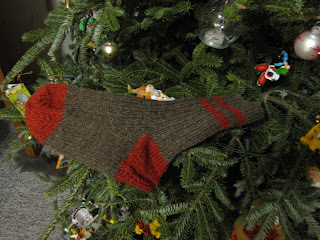 Brigs and Little's Tuffy (sock pattern by B&L written for that yarn). He got the second one just after New Years. 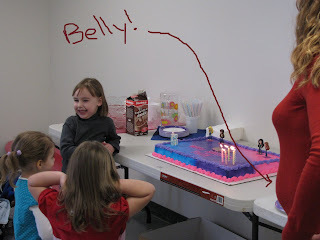 Girly's Birthday party was a total success. Skating was fun once Daddy started pushing her on a chair. She had a ball and so did all the kids who came. The gift grab was the best part and I think there may be more than a few parties in town doing the same thing. There's just something appealing about not having to haul home a ton of stuff and trying to find more room in a house bursting with toys for yet more they'll only play with now and again, if at all. Girly also discovered Rock Band at a friend's party. She played the guitar (even hit a few of the notes) and the drums (did a bit better there). It was great fun. The most fun we've had lately though, was on Saturday. We hit the local sliding hill and Girly found the courage to give it a try. A lot. Momma had to call it quits due to not being able to make it back up that hill one more time with her sled. Next time we go, Daddy's going to be off work and Momma is going to stand at the bottom of the hill. Even the little dog is finding his niche. The cats have decided that while he bears watching closely, he might not be completely scary. I think it helps that he is more leery of them. Unless Momma is right there.